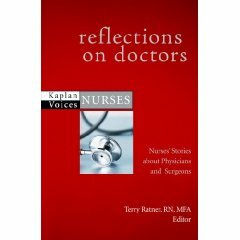 It was my great honor to work with Ms. Terry Ratner on Reflections on Doctors, an anthology written by and for nurses for publication in September 2008. Ms. Ratner exhibited all of the hallmarks of a serious editor: she adhered to a challenging schedule and worked to craft a well-written manuscript with great integrity. It is a manuscript we are proud to publish. I highly recommend Ms. Ratner for future editorial projects. In Reflections on Doctors, renowned nurses take you behind the closed doors of the OR, to the bedside, and to the scenes of international emergencies as they share stories about their work alongside physicians. Whether you’re a seasoned nurse or someone interested in understanding the dynamics of communication between physicians and nurses, you’ll have a front row seat under the big top of the health-care arena—a view of the past, present, and a glimpse of the future. Engaging and revealing, Reflections on Doctors provides new insights into this important partnership. A nurse practitioner is called upon to train doctors in war-torn Kosovo. A midwife collaborates with a physician to safely provide her high-risk patient with the birth experience she desires. A nurse refuses a doctor’s orders. A nursing student is told she is “smart enough” to be a doctor. A nurse leaves the profession to become a physician. In this fascinating anthology, representing a spectrum of voices and experiences, nurses speak openly and movingly about the unique roles of physicians and nurses, the wonderful collaborations that have transformed health centers and communities, and the learning experiences that nurses and physicians offer one another. Reflecting upon their partnerships with physicians, Cheryl Dellasega, Tilda Shalof, Adrienne Zurub, Cortney Davis, Paula Sergi, Cara Muhlhahn, and a host of other remarkable nurse-writers plumb the depths of power differences, gender dynamics, and the history of the nurse-physician relationship. They reveal what it takes to build a strong healthcare team. >> Purchase now from Rittenhouse Book Distributors, Inc.